One of the most difficult tasks to perform when we want to maintain our anonymity over the Internet is to locate anonymous proxies that aren't occupied. To do so, we have to visit specialized websites and forums and try out servers until we find one that's free. 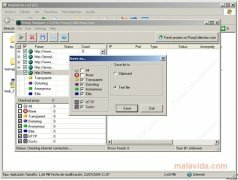 Proxy Vampire is an application that combs the Internet and several specialized sites by means of a special search algorithm that locates all kinds of proxy servers, indicating their status and their typology. The program differentiates four proxy server levels depending on the degree of anonymity that they offer, from those that don't hide your original IP to those that even hide that you're behind a proxy server: 'Transparent', 'Anonymous', 'Distorting' and 'Elite'. How it works is very basic. In the two columns of the left we indicate the type of proxy and the sites where we want it to search. We start the search with the "Analyze" button and it offers us a list of proxies providing all kinds of data about each one of them. We can store the list in a text file or on the clipboard. The program is ideal to add proxy servers to any anonymity tool. A simple and complete help to preserve our privacy while we browse the Internet.